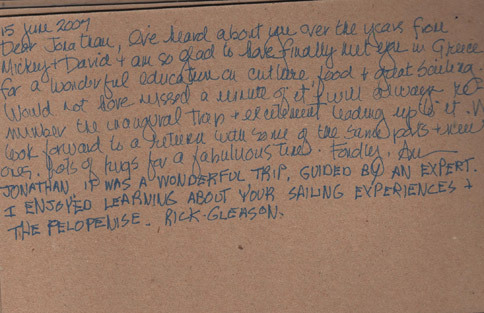 “Dear Jonathan, I’ve heard about you over the years from Mickey & David, and I’m so glad to have finally met you in Greece for a wonderful education on culture, food and great sailing. Would not have missed a minute of it and will always remember the inaugural trip and excitement leading up to it. We look forward to a return with some of the same ports and new ones. lots of hugs for a fabulous time. Fondly.” Audrey.